Tricorn Systems’ Shop Floor Data Capture system is designed to provide vital information directly to shop floor operatives that is accurate and current. TRICORN:SFDC-e is driven by the TRICORN:Scheduler or TRICORN:Planning Board and provides real-time “work-to” lists to terminals so operators are informed of changes to job priorities immediately rather than being issued with paper lists that can be superseded within minutes in a dynamic working environment. TRICORN:SFDC-e allows the operator to view all jobs/operations for a specific work centre (or group of work centres) within a selected period and by selecting a job can see information on preceding and succeeding operations. 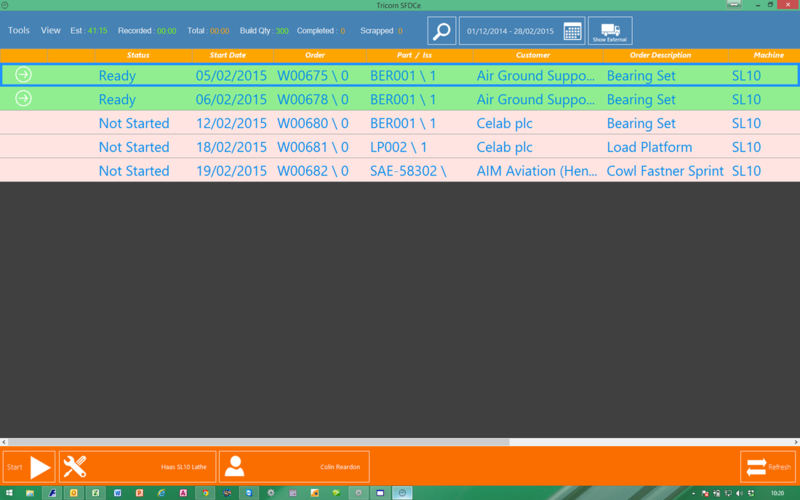 The job can then be logged onto and vital information recorded which automatically populates the relevant areas in TRICORN:Production. Once an operation is ready to execute the operator can indicate to the system whether they’re “setting” or “running” thereby enabling times to be recorded for both – which can then be compared to the setting and run-time estimates. If the part is a regularly manufactured production part these actual times can be used to update the parts master template time estimates to better reflect reality. Breaks/pauses can be recorded. If an operator is working multiple machines they can pause all of them by a single click and then restart them all via another single click. 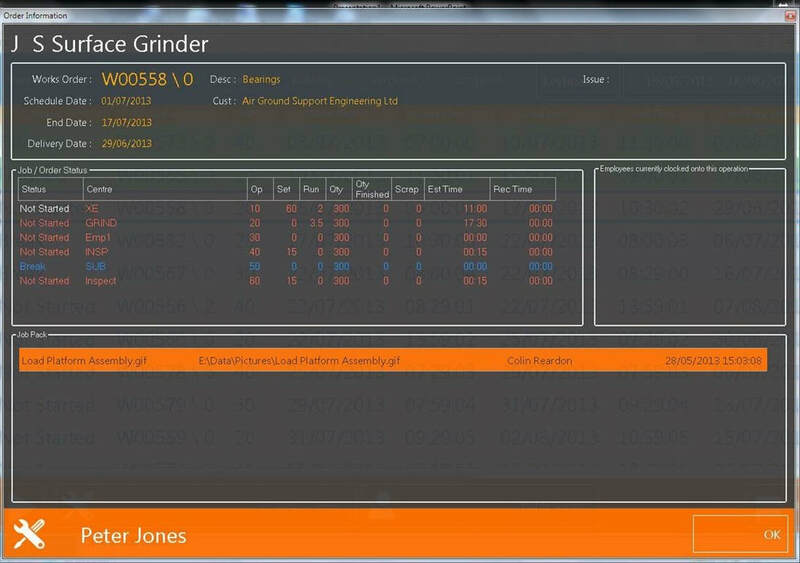 Estimated setting and run times can optionally be shown on the screen against each operation. Multiple operators can be logged onto a job/operation concurrently and all the times are recorded within the TRICORN:Production system. Job/Op duration can optionally be amended by operators on the shop floor (e.g. if they forgot to clock off a job) although this can be hidden so that any changes are effected by the production manager or admin staff. Any file can be linked to a job or operation and the file can then be viewed on the terminal (as long as the application relevant to the file also resides on the terminal). The files can be attached to works orders in TRICORN:Production and they are then available to the operator at execution time. Drawings, tooling instructions, setting instructions, video clips and NC programs can all be linked to a works order or operation – the first step towards paperless manufacturing! The operator can record notes against each time period (a touch-screen keyboard can be launched) so that any vital information about the operation can be recorded for later review and possibly adding to the manufacturing notes and job instructions on the Job Card. For long running jobs the operator can enter the number of parts completed which can then inform the TRICORN:Scheduler of an estimate of how much time is left to complete the operation. Scrapped parts can be recorded with user-defined reason codes for later review by Quality Control and management. The Work Queues (Machine Loading lists) are built by the TRICORN:Scheduler or TRICORN:Planning Board and communicated to the shop floor terminals. Any change to job priority is instantly updated on the terminal so there is no need to regularly run to the workshop to amend “work-to” lists. Each terminal can control up to ten work centres (resources), although in many cases a single terminal per resource is recommended. Similar resources (lathes, mills, turns, welding bays etc) can be grouped onto a single terminal. 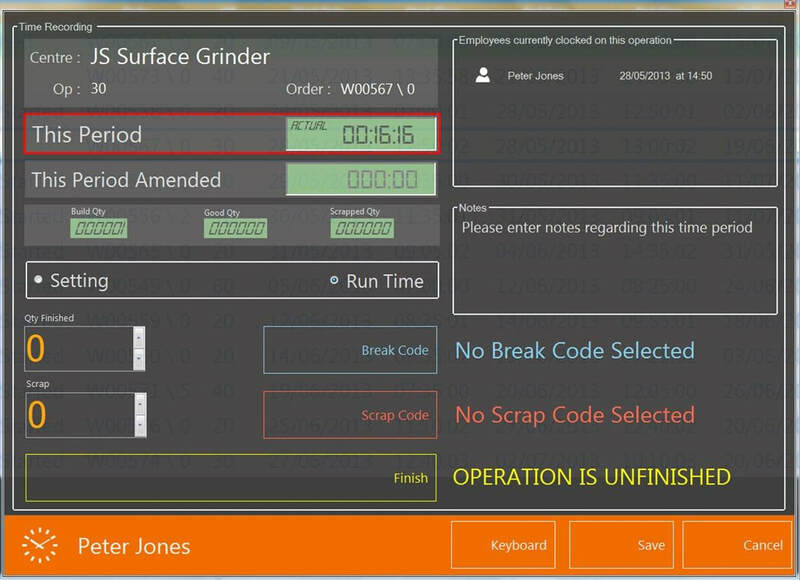 The operator can click on the operations in the work queue to see the status of preceding operations and assess how long it will be before the operation designated for their machine is ready to execute. All information relevant to the job is shown on the terminal – Works Order No., Scheduled Start Date, Delivery [completion] Date, Customer Name, Part Description, Part No. & issue.